Spring is here, and the weather has finally caught up to the change in seasons. Easter is coming up, and Kellogg's wants to help you celebrate. They have just launched their Spring Rice Krispies cereal. The same cereal we know and love, with spring colours added in. You can find it at your local grocery store, and they also have Rice Krispies Bars available with the spring colours. Let Kellogg's into your Easter celebrations. Grab a box of the new Rice Krispies Cereal and make some Easter or spring themed Rice Krispies treats yourself. You can use the guide to make some easy nests, or you can come up with your own creation (an egg, a bunny, a tulip). What would you make? 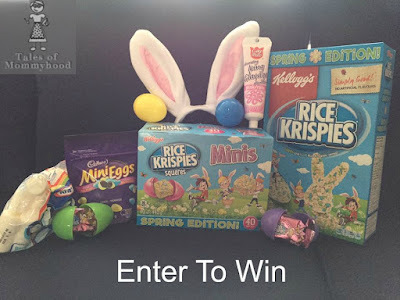 Kellogg's wants to supply one of my readers with their very own spring themed Rice Krispies treat kit. Simply fill out the form below for your chance to win. Open to Canadian residents 18+, ends on April 20th, 2017. I like things to be easy so I think I would make a slab and then use Easter cookie cutters to make my treats! I would like to make baskets so, I can put treats in them.. I also would love to make like bunnies. I would love to try to make some bunnies first. I would make Rice Krispies eggs ! We would try the little nests. They're so fun. A tulip would be pretty for spring. Thanks for the chance to win! We're making both the nests and the eggs this Easter. I would like to make a treat that incorporates flowers. I can't wait until my flowers are in bloom! I would try to make a tulip! I would love to make some bunnies first. I would make rice krispie bunnies ! The spring themed treat i would to make first is the Bunny! I'd love to make some eggs. I think the birds nests are perfect ! I would like to try making a tree with eggs on it. I would make some pretty flower shaped rice krispie treats! We would make little bunnies and egg-shaped treats! I think I would try to make an Easter basket. I would like to make eggs in a nest for the grandkids. I would make the little nests. So cute! I think I would make some bunnies since I have a large cookie cutter -bunny head and ears. It would be perfect. I would make the egg baskets! I have already made the bird nests and they are so cute and taste delicious. I would make spring coloured/multicoloured rice krispies squares! It would be the birds nests for us. I'd love to make the nests for my kids! I'd make peep/bunny shaped rice krispies. I would make some cute little egg baskets first. I want to make treats to give to the first year law students after their last exam. I would make some cute bunnies first. I would make the egg baskets. I would make these nests with my grandchildren. I would make egg shapes. and some bunnies too! I would make the little egg nests. I would make the easter bunny! I would make the nests for sure. My daughter is 4 and LOVES real eggs (as she calls Mini Eggs) and "Krispy cereals". She would be thrilled to have this kind of treat :) And how have I missed these Spring Rice Krispies????? I would make a bouquet of tulips! I'd make the easy nests for this Easter weekend! Would make a Bunny! Thank you! I would make the nest and eggs treat first-very cute! to win a Spring Themed Rice Krispies Treat Kit. What spring themed treat would you make first? I would make some Rice Krispies Treats shaped like bunnies. I would love to make those little nests, but the first thing I would probably make is a bunny with my kids. I would make the Easter Mice . They're so cute ! The little nests with the eggs are cute and easy to make. not sure if my comment went through,,I`d make the little nests with the eggs,,so cute and looks delicious! I like the little nests you made, I would make those. I would love to make one of those cool 'surprise' cakes that you cut open to reveal that the center is full of Mini Eggs! Yum!!! I'd make the Easter egg nests. So cute. My kiddo would love to make some Spring garden flowers! We would love to make these nests - they look great! I would make Rice Krispies eggs first. Those nests are super cute and I know my kids would love to try to make them. I would make the eggs! I just like traditional Rice Krispies cake, as its simple to make. My daughter would love to make those little nests! I'd make a gigantic easter egg. I would make a bunny! My granddaughters would like to make the little egg nests. I would definitely make a bunny! I would make the bunny first. I would give the bunny a try. I would try for the bunny. I would enjoy making the egg nests. I think the nests are super cute. I'd make those. I would love to try to make the nest first. I would make the bunnies. I would make rice krispies treats first. I love to keep them made all of the time. I'd make the nests...they are sooo cute. I would make the Easter egg baskets first with the rice krispies. I'd make the mini egg nests first. The nests are super cute! we would those first! I want to try to make the nests for spring treats! I would make the nests first! Those nests are adorable! I'll definitely be making them because rice krispies squares and mini eggs are both delicious. I'd like to make those little egg nests. How cute are they!? The nests are sweet and I have some cute Japanese egg molds to make egg shapes! So cute! I would love to make some nests and some chick shapes! I would like to make the egg nest. Would make these egg nests. So cute and perfect for spring! I think I would make easter eggs. They would be the easiest and the best to decorate.